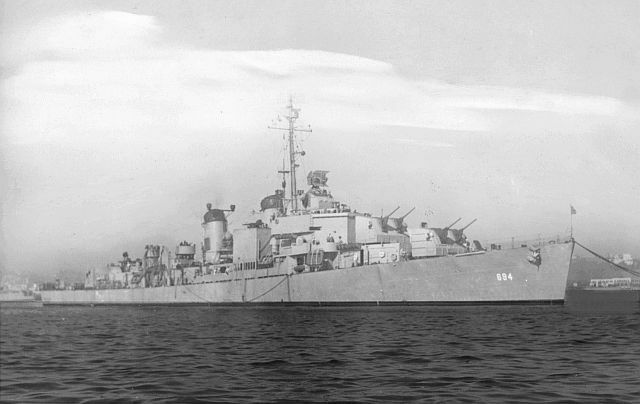 USS Ingraham (Cdr. W.M Haynsworth, Jr.) sank after a violent collision with the Navy oil tanker USS Chemung in 'pea-soup fog' off the coast of Nova Scotia in position 42º34'N, 60º05'W. The Ingraham was part of Task Force 37 escorting Convoy AT-20 to the United Kingdom. An internal explosion caused the ship to blaze from stem to stern. It was all over in a flash, the burning wreck vanishing beneath the waves taking the lives of 219 of her crew. There were only 11 survivors, 2 officers and 9 ratings all rescued by the Chemung's boat crews. Decommissioned and stricken 16 July 1971. Transferred to Greece 16 July 1971 being renamed Miaoulis. Miaoulis was stricken in 1992. Miaoulis was finally sunk as a target on 9 October 2001.